This topic has been on my mind a lot lately, so I wanted to repost a blog I wrote last year- you know- back before KK actually had her baby. It’s still a relevant topic and it’s still an issue, in my most humble and vocal of opinions…. Am I really about to write a blog post about Kim Kardashian? Sigh. Yes. Yes I am. Sort of. See, I have an aversion to how the media portrays Pregnancy, Labor, and Post-baby bounce-backs (or lack thereof). My blood boils when the media makes fun of pregnant women who gain more than 20 lbs. during their pregnancy. I’m outraged that the media makes it seem perfectly normal that people like Britney Spears have 2 elective C- Sections merely because she was admittedly scared of labor. I want to rip the cover off of People magazine when they post that a Hollywood new Mom of the week lost “30 lbs. in 6 weeks” and has her, on display, in her bikini all airbrushed and perfect with her newborn baby on her hip talking about her diet of smoothies and soups to shed the weight. These are the kinds of things that make women feel inferior, like something is wrong with them if they gain weight and, god forbid, if it takes them more than 6 weeks to get back into their bikini. These are the kinds of things that make women take the focus off of being healthy and enjoying their pregnancy and, instead, they worry incessantly about gaining too much weight and “ruining” their body. The strive for Perfectionism in parenting and what it means to be a good Mom is a hot button for me and one I’ll continue to shout about from here until I die. But I have to now address Kim K.
As obnoxious as the Kardashian empire is and as much as I watch it like a train wreck (I admit my love for E and Bravo), I am happy to see Kim putting it all out there. Yes, she has gained some weight in her pregnancy. But so what? Look at her physique. She is a voluptuous woman to say the least. She was, no doubt, going to be a voluptuous pregnant woman also. I admire her for wearing whatever the hell she wants. For wearing form-fitting clothes. For wearing a bikini for the world to see. I wish she would give the Media the finger. This is what pregnancy looks like sometimes. We are all different. Every woman’s body responds to pregnancy differently. And everyone loses the baby weight in differing ways. Are you really going to compare her to Shamu? Seriously?? It took 4 months for me to feel like I was back in my own body. At 6 months the weight dropped and my muscles started coming back. Did you read that? 6 months for her to feel like she was getting her body back. 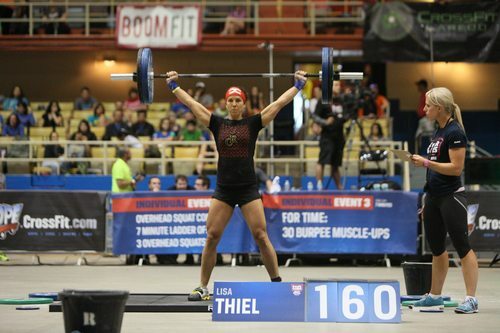 This is Lisa last weekend at the South Central Regionals where she took 12th place! BOOM! And she is, in her own words, not even 100% yet! It’s all relative. It took me 18 months to lose the baby weight after my second pregnancy. It sucked! I felt horrible and ugly and fat. I was depressed and miserable. Then I found Crossfit and the clouds opened and there were rainbows and unicorns and all that. Not really but kinda. As I end this rant/blog let me just say I know I’ll probably be disappointed in a few months when I see Kim Kardashian on the cover of People in her bikini with Baby Kimye on her hip. But my ultimate goal is to show women what Reality looks like. That there is no “normal” but rather a New Normal that is varied for every single one of us. This post has inspired me to write more, so watch out! 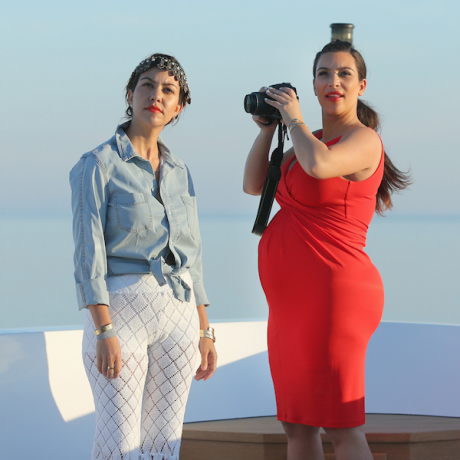 Until then, I’m gonna go check out what Kim and Kourtney are up to. You know, for research purposes. SEE YOU ON FRIDAY AT SOCAL REGIONALS! Look for me. I’ll be the one in the brand new BirthFIT tee! 1 comment to " Who You Callin’ Shamu?! Pregnancy and Body Image "